the human structure and order that ideally allows a human being to fully function and realize their potential. The term Systemic Constellations or Family Constellations are some of the names used for the work by the renown German psychologist Bert Hellinger. Parallel to his work, but unknown to each other, Solihin Thom and his colleague Francois Reynolds, who was followed at a later date, by Alicia Thom, developed what we call the Human Template Model. Both Hellinger’s work and ours are characterized by the use of constellations: the practice of using the ‘knowing field' (a term coined by Dr. Albrecht Mahr) to elicit a dialogue-response in participants to illustrate the dynamics of a particular set-up of representative participants who are constellated (like a star formation) around a particular ‘sun’. The sun may be, in Hellinger’s work, a principle person and his or her relationship, and/or the principle’s family dynamics. However, the approach taken by InnerDialogue, the constellated ‘sun’ will be a principle–the Divine, goal, mission, personal deity, the person, illness, business, or an idea propagated by human thought or enquiry–and the surrounding constellation will be the sum of parts involved. and beliefs, ideas, analytical and gestalt thoughts, theology (neocortical brain) or human self; executive functioning. These different natures all contain mass. When altered, each may affect us, as their mass transforms into energy and then, when this mass moves and influences us, acts as a force –each force, relative to their rank or station, affects us differently. Each level of being exhibits a different force, which affect us in particular ways, upsetting our original hierarchical set of natures. In classical Islamic theology these selves or elements of mass are called the lower natures or nafs. In western culture, we may allude to these nafs as some base instinct or an emotional state; not putting too much emphasis on their hierarchy, but simply as an element of the human. We may say, ‘he’s sub-human’ or that someone acts as a ‘pig’, or indicate that someone who is not very proactive as a ‘couch potato’. Someone we cannot quite get hold of, as ’slippery as an eel, or ‘sly as a fox’. These terms elicit a metaphorical narrative; and allow us to convey the sense of the principle life force that the person operates from (at that present moment, or at the time of the story). 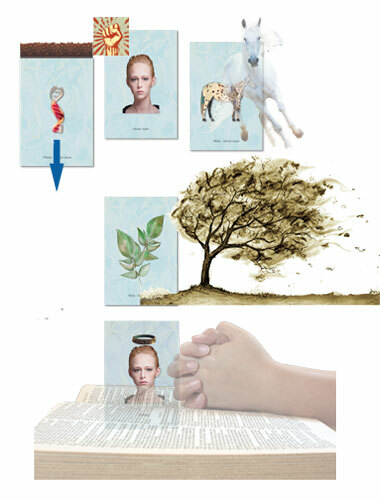 In a constellation the principle (person) lays out their ‘cards’ by using people to illustrate each level of being. They are 'in' the constellation, and they use others to represent their lower or other selves. This constellation, which may be structured ('Here are the elements in their order, please fill them with people who represent your differing selves'), or haphazard ('Place others around you to represent your differing selves in what ever way you are guided'). This would be their opening representation. It relays (broadcasts) their state. A very generalized arrangement of the internal disorder of human being (–'correct' relationship on the left). We use the act of surrender–or interior quietness and silence to guide us in this process of constellation. After the initial set-up, we ask all the participants, in the constellation or those watching to surrender. We can call this a stop-motion process to facilitate the unraveling or unfolding of the constellation. The act of surrender to the Divine (a central tenet) allows us to be guided, as the participants acting as elements of the principle, illustrate their receiving (guidance). When the surrender is over, they are given the opportunity to talk about their inner experience, standing where they have been placed. These signals, sensations, physiological states occur whilst in their surrendered state. We try not to get the person to talk too much, knowing how easy it is for human’s to articulate through their own filters, own thoughts about the 'other' or their own pattern. The facilitator guides the process; by asking repeatedly for the participants to surrender. In this way the constellation unravels, opens up, reveals the principle's state and resolution. In practice, the facilitator uses the feedback from the participating ‘elements’ to be guided in re-arranging the constellation based on what is articulated. As we are able to access signals or information through the various elements of our physical body, we can be guided into understanding what each element is saying. This is complex and sophisticated work, and at some level demands an expert to help. On the other hand we can extrapolate and be guided within our own reference and understanding, so this work can work either way. Graphic to illustrate the dynamics of an disordered internal content. The weight of the earth (material) captures the human, whose reactivity (animal, instinctual) with this hidden historical pattern, contains the feelings, and deeply buries (and hides) an old religious model of surrender or nobility. 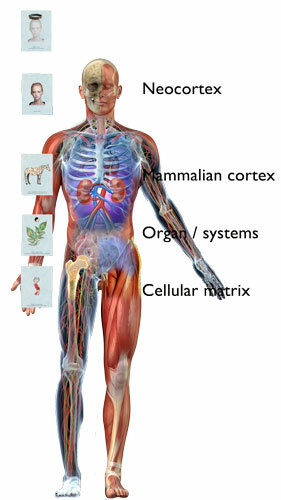 A human body receives information from different parts of the organism. It is like the different wisdoms which we have inherited from the differing life forms which are phylogenetically within us, and we have the chance to listen to this collective orchestra. However, as an organism equipped with a neocortex, we have the possibility of constructing or creating reality–that is, we can manufacture signals through our own needs, proclivities, immaturity and hubris. Our differing selves / elements feed, through surrender, the human mind (in its mindful state) with information pertinent to the situation. This process may also descend upon us, to give us an alternative reality when our own sensory guidance cannot ‘see’ or ‘hear, feel’ or ‘notice’ what needs to be accessed. This is the action of Grace, and it the act of surrender that allows us to receive somatosensory information representational to the situation or to be given noetic understanding through received understanding. The facilitator re-arranges the constellation as per ‘picture’ or stop-frame, and then proceeds with further surrender or quiet to allow the participants to be guided further. This allows the constellation to evolve–actually to unfold like a spiral of creativity, a torus within THE whole. With the addition of further revealed qualities (again mirrored by participants acting out these elements or qualities) the narrative can unfold in many differing ways. The unfolding narrative may illustrate the distortion present, or elicit the force which has become dominant and holds the person ‘captive’ or disordered. It may bring in other elements; such as ancestors, 'ghosts', unfinished business, discarded parts–either new or missing resources that would augment changes in the person to shift their state. We can finish the constellation where all human parts or intact and present, or stop the constellation to illustrate the state. We can be as creative as we want, but always having the participant or person in mind, so that their constellation creates the bridge to change or restructuring of their internal order.